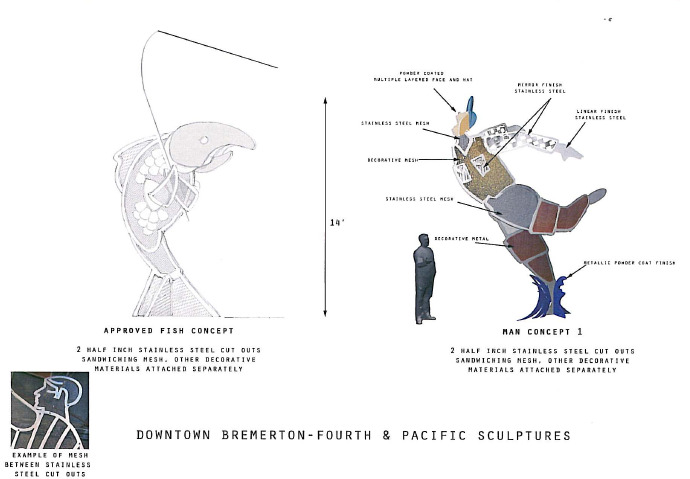 The Bremerton City Council reversed itself and gave a victory to all fish who’ve ever been tempted by a worm, or something shiny only to later find a final resting place on a plate. 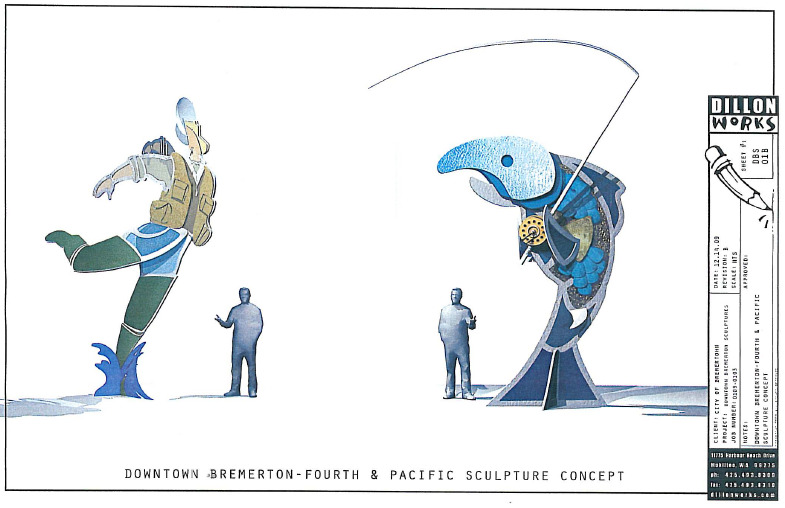 With a 7-2 vote, the council voted to have the fish catching the fisherman in the $250,000 statues slated to grace downtown at Fourth Street and Pacific Avenue. “It’s art,” said Will Maupin when asked to explain why he decided to make the motion that was not on the agenda. He said he talked with some people. “I changed my mind.” So did Carol Arends. Both had previously voted for the more traditional view of a fish and fisherman doing what they do in real life. Council members Dianne Robinson and Cecil McConnell did not, apparently being no fans of whimsy. They were the only ones to hold fast to tradition. Roy Runyon, Adam Brockus and Nick Wofford voted as they did before, giving the fish the reel and the fisherman the hook. New council members Jim McDonald and Greg Wheeler also voted for the fish. Wofford had explained that since the council would be overturning an earlier decision, it would need a supermajority, which it got plus one. Rumors that this could happen surfaced a couple of weeks ago, prior to the last regular meeting. But it appeared then that not enough council members would be willing to bring the statues up again. Not doing it then appeared to kill the idea, but council members said doing it tonight still gave the designers time to stick with the earlier plan. So whimsy zealots get your way. Those who thought the city ought not spend $250,000 on statues, you don’t. Silvia Klatman, executive director at the Bremerton Area Chamber of Commerce for nearly a decade, announced Tuesday she is resigning to take a new job. Klatman will work in public affairs with the Naval Undersea Warfare Center in Keyport beginning in January. Steve Green, president of the chamber, said Klatman will be difficult to replace. “She’s done a wonderful job for the community,” he said. 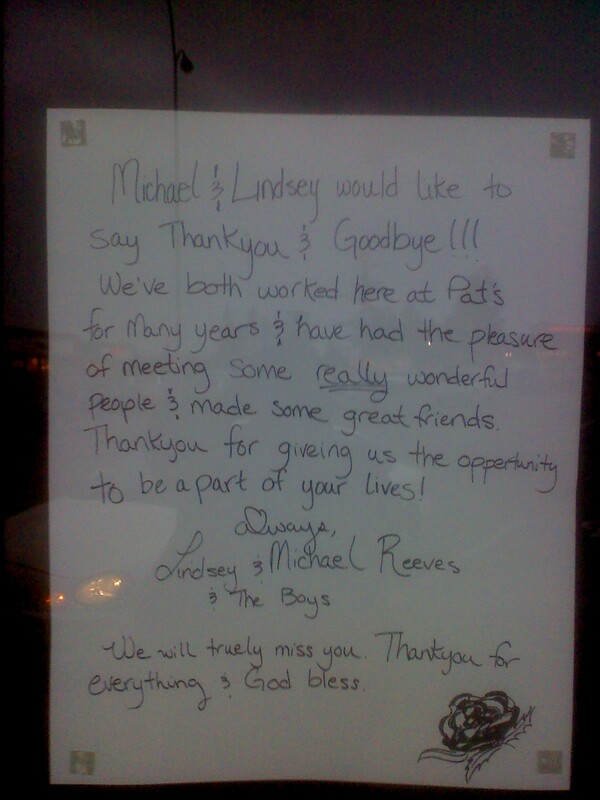 Green said the chamber’s board will wait until Jan. 4 to begin accepting resumes for a new executive director. Between now and then board members will be coming to an agreement about what they are looking for in Klatman’s replacement. In addition to running the day-to-day affairs for the chamber, Klatman was often the face of the organization, leading chamber lunches and moderating early-morning political debates during campaign season. She began as executive director in August of 2000 but had worked for the chamber before as well as for the Kitsap Economic Development Council. Klatman said Bremerton’s volunteers and business leaders will continue to keep the city growing. “The big thing that Bremerton has going for it, and frankly has always has had going for it, are the people,” she said. Anyone who would want to overturn Bremerton’s potential spending increases should contact city and other sources for specifics about the rules for a referendum. What we have here are the basics as I understand them. If you want to start a referendum on the city council’s decision to have the city’s utilities pay more to the general fund, you can. You can kill that. Should the council decide to raise rates at its meeting on Dec. 2, your referendum will have no impact on that. Your rates will still go up. If you want to start a referendum on the property tax increase the council passed, you can. The points here were the result of a conversation I had with Roger Lubovich, city attorney. 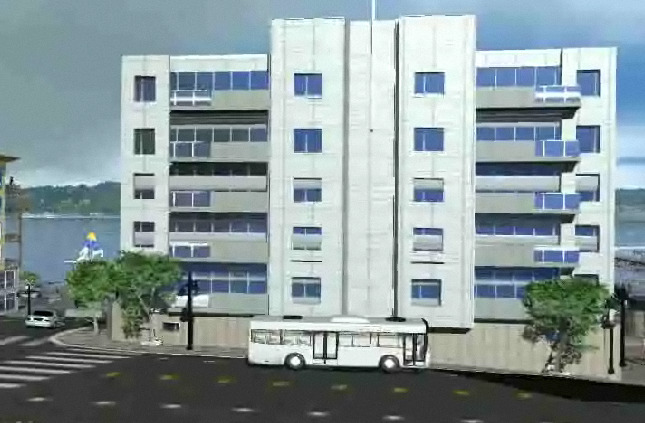 I had also called the Municipal Research and Services Center, which looks into laws for cities. 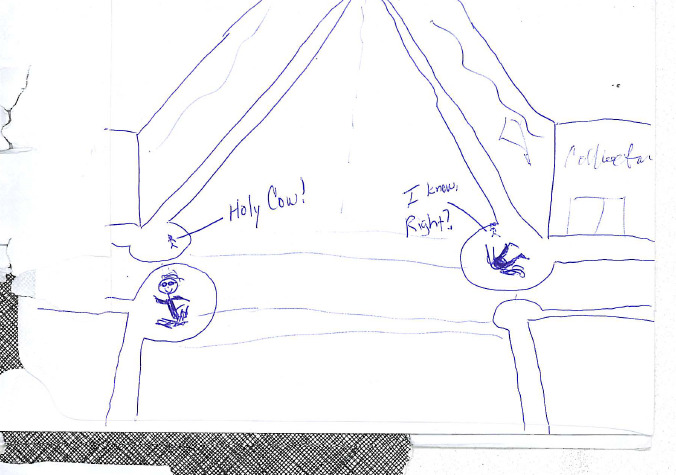 Lubovich and I talked Wednesday night after the meeting. At that point he was under the correct impression on the first two points, but said he thought there was no referendum possible on the property tax. After looking into it further and talking about it with a representative at MRSC, he determined Thursday the property tax measure actually is eligible for referendum. Point One: The state treats the payment in lieu of taxes, aka PILOT, like it treats a business and occupation tax. Someone can file a referendum with the city clerk within seven days of the ordinance passing, which was Wednesday. The clerk and the petitioner have 10 days to confer over a petition. The petitioner then has 30 days to gather signatures of 15 percent of registered voters. Point Two: Perhaps the most puzzling part of this issue is that if you have a referendum on the Pilot, it has absolutely no bearing on the rates. You could kill the transfer of funds from city utilities to the general fund, but all it would mean is the utility service would be able to keep the money. Point Three: Based on my read of what’s in the city charter (Section 34) and the state law it references, a referendum on the property tax hike would roughly follow the same rules as the one on the PILOT, except you might need signatures from 25 percent of registered voters. State law allows the city to get 1 percent more each year in property tax collections, assuming inflation is at least that high. This year there was deflation of slightly less than 1 percent, so the city would actually have to collect less. The question affects collections for years to come, because whatever the city collects this year is what it will base next year’s collections on, and so on.